Philotheos Bryennios, Metropolitan of Nicomedia. Metropolitan Philotheos (Bryennios) of Nicomedia ((Greek) Φιλόθεος «Βρυέννιος» Νικομηδείας), 1833 - November 18, 1917, was a Greek Orthodox metropolitan who discovered the Didachē manuscript in 1873,[note 1] containing copies of early Church documents. He was also Principal of the Theological School of Halki, Principal of the Great School of the Nation, the Metropolitan of Serres, and ultimately the Metropolitan of Nicomedia while serving several concurrent terms on the Holy Synod of Constantinople (1877-1884, 1894-1896, 1904-1910). Philotheos’ secular name was Theodore, although his surname is unknown. He was born in 1833 in the Tatavla quarter in Constantinople, of poor parents, and was first educated in the local schools there. Because his parents lacked the necessary resources in order for him to continue his education, he was obliged to chant in the Church of St. Demetrios, in the same neighborhood. Eventually he came under the tutelage of the then Bishop of Cyzicus (and later Ecumenical Patriarch) Joachim II. With the assistance of Bishop Joachim he was accepted into the Theological School of Halki. After the completion of his studies, along with his being proclaimed as a teacher of Orthodox theology, he was ordained a deacon. Simultaneously he received his clerical name Philotheos. In honour of his having excelled as a graduate of the School, he also received the epithet “Bryennios”, which was given to him by the then principal of the school Constantine Typaldos. After graduating in 1856, he received a scholarship as an endowment of George Zarifis, and traveled to Germany, where he continued his theological and philosophical studies in the universities of Leipzig, Berlin and Munich. Early in 1861 he was invited by Patriarch Joachim II to Constantinople, and was appointed professor of church history, hermeneutics and other theological courses at the Theological School of Halki. In 1863 he was ordained to the priesthood as an Archimandrite. Simultaneously he succeeded the principal of the Theological School of Halki, Constantine Typaldos, who had retired due to old age. In September 1863, Joachim resigned from the patriarchal throne, and Bryennios lost a powerful protector. Eventually he was pressed to resign from his seat as principal of the Theological School of Halki. In 1867 when Gregory VI (1867-1871) was raised to the ecumenical throne for the second time, Philotheos was appointed the principal and a professor at the Great School of the Nation in Phanar. [note 4] He directed the School for the next seven years. During his tenure there, he was honored by the Greek government with the golden cross of the Knights of the Royal Order of the Redeemer. During the same period he also served as member of the Central Education Committee, vice-president of the Seminary Education Association, and curator of the Central Seminary. Finally, in 1875, together with Archimandrite John Anastasiadis and Deacon Philaretos Vafeidis, he represented the Ecumenical Patriarchate in the Old Catholics Reunion Conference held in Bonn. When he returned from Germany, Patriarch Joachim II (who had risen again to the patriarchal throne from 1873) asked Philotheos to be the Metropolitan of Serres, because this metropolis was in need of a bishop well versed in the Bulgarian and Ottoman Turkish tongues. At first Philotheos refused the proposal, but later he acquiesced after receiving an assurance from Joachim that soon thereafter he would be appointed to a senior («γεροντική») metropolis. Thus, he was elected Bishop of Serres on August 7, 1875. After the death of Bishop Dionysios of Nicomedia on August 21, 1877, Philothoes was elected by the Holy Synod on August 24, 1877 as the Bishop of Nicomedia. The election took place at Halki, and Philotheos also had the support his benefactor George Zarifis. 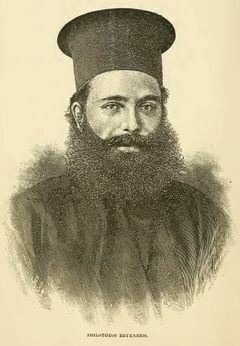 In March 1880, together with the Bishop of Philadelphia Gerasimos, and the jurist Alexander Nahum, he was sent to Bucharest as representatives of the Orthodox Patriarchates of the East (Constantinople, Jerusalem, Alexandria and Antioch) and the Autocephalous churches, for discussions with the Romanian government concerning the fate of the plundered monastic estates which had been confiscated in 1862 by the Domnitor of Romania Alexandru Ioan Cuza. In the same year (1880) he was awarded a PhD in Theology from the University of Athens, and in 1884 he was awarded the same degree by the University of Edinburgh. In 1896, he travelled to Moscow along with then Bishop of Anchialos (later Bishop of Smyrna) Basileios, where he represented the Ecumenical Patriarchate at the coronation of Tsar Nicholas II. Apart from the many terms that he served in the Holy Synod (1877-1884; 1894-1896; 1904-1910), he was also president of the Patriarchal Central Education Committee, and Commissioner of the Registry of the Theological School of Halki (Registrar). In the debates that were conducted within the Ecumenical Patriarchate between supporters and opponents of Patriarch Joachim III, Philotheos was originally a fierce anti-Joachimist, but he changed attitude to Joachim III during his second patriarchy (1901-1912). With respect to his own Metropolis of Nicomedia, he carefully supervised the organization of the metropolis by establishing and rebuilding churches and schools, and by renovating from its foundations the Metropolis building, which was located within the enclosure which also encircled the Metropolitan Cathedral Church, in the vicinity of the coast of Astacus in Bithynia. In the task of supporting educational institutions in the region of Nicomedia, Philotheus was greatly aided by George Zarifis. Thus, when Philotheos was elected Bishop of Nicomedia, Zarifis donated 600 Ottoman Liras for the construction of a school there. In 1910 Philotheos resigned from the Metropolis of Nicomedia due to old age, having exhibited strong signs of visual impairment, like his predecessor, Constantine Typaldos. He retired to the Theological School of Halki, with the title Lifetime Honorary President of the Registry of the School (Registrar), but without ceasing his writing activities and dictating his thoughts in full clarity of spirit. Bishop Philotheos died on November 18, 1917 at the age of 85 years, at the School of Halki, and was buried in the precinct of the School. Throughout his lifetime Bishop Philotheos was a man of letters and science, but also a great preacher. Today his relics are kept in a plain grave behind the church of the School, with a marble cross, which he himself had built in his youth, while he was an employee of Christofis Paschalides. He became known in the West by publishing two very important documents of Christian antiquity, based on a manuscript discovery he had made in 1873. While in Constantinople, he discovered a manuscript in the Jerusalem Monastery of the Most Holy Sepulcher (in the Greek quarter of Constantinople), that contained: (1) a synopsis of the Old and New Testaments arranged by St. John Chrysostom, (2) the Epistle of Barnabas, (3) the First Epistle of Clement to the Corinthians, (4) the Second Epistle of Clement to the Corinthians, (5) the Teaching of the Twelve Apostles (Didachē), (6) the spurious letter of Mary of Cassoboli, and (7) twelve pseudo-Ignatian Epistles. The Letters were published in 1875,[note 6] and the Didachē in 1883,[note 7] both with valuable notes of his own. After its publication the Didachē triggered many research studies in Europe and America, and was released in several translations. Hermeneutic Study on the Gospel for the First Sunday of Lent, Constantinople 1915. The Rich Youngster (Constantinople 1919), which was published posthumously. The prepared notes which he had used for the course which he taught on Church history at the Theological School of Halki have remained unpublished however. ↑ The Didache is considered part of the category of second-generation Christian writings known as the Apostolic Fathers. ↑ Similar to the experience of Eugenios Voulgaris about a century earlier, the Modern Greek Enlightenment in the 19th century had affected the sociological and political make up of the newborn Greek state with a westernized Enlightenment ideology, and was thus treated with suspicion and was resisted by popular preachers such as monk Christophoros Panayiotopoulos (Papoulakos, c. 1770-1861), as well as by Apostolos Makrakis to some extent. ↑ Tsachsiriou, from Turkish çakşır, - baggy type trousers worn by men, with wide pleats. ↑ The Patriarchal Academy in Constantinople, known to Greeks as the "Great School of the Nation" - (Greek): Μεγάλη του Γένους Σχολή. ↑ In 1872 a Council of Constantinople (Pan-Orthodox Synod) was convened and presided over by Ecumenical Patriarch Anthimus VI, and attended by Patriarchs Sophronius IV of Alexandria and Procopius II of Jerusalem and several bishops, condemning phyletism (ethnocentric belief that Orthodox Christians in a given place and time should be divided into separate exarchates, based on ethnicity), and condemning the Bulgarian Exarchate (the official name of the Bulgarian Orthodox Church before its autocephaly was recognized by the Ecumenical See in 1945, and the Bulgarian Patriarchate was restored in 1953). ↑ Title: (Greek) "Του εν αγίοις πατρός ημών Κλήμεντος επισκόπου Ρώμης αι δύο προς Κορινθίους επιστολαί, εκ χειρογράφου της εν Φαναρίω Κωνσταντινουπόλεως βιβλιοθήκης του Παναγίου Τάφου, νυν πρώτον εκδιδόμεναι πλήρεις μετά προλεγομένων και σημειώσεων υπό Φιλοθέου Βρυεννίου, μητροπολίτου Σερρών. Εν Κωνσταντινουπόλει 1875." ↑ Title: (Greek) "Διδαχή των δώδεκα Αποστόλων εκ του ιεροσολυμιτικού χειρογράφου νυν πρώτον εκδιδομένη μετά προλεγομένων και σημειώσεων, εν οις και της Συνόψεως της Π.Δ. της υπό Ιωάννου του Χρυσοστόμου, σύγκρισις και μέρος ανέκδοτον από του αυτού χειρογράφου, υπό Φιλοθέου Βρυεννίου, μητροπολίτου Νικομηδείας. Εν Κωνσταντινουπόλει 1883." ↑ See: List of encyclicals of Pope Leo XIII. Wikipedia. ↑ Title: (Greek) "Πάπα Λέοντος ΙΓ΄ εγκυκλίου επιστολής έλεγχος υπό Φιλοθέου Βρυεννίου, μητροπολίτου Νικομηδείας, δημοσιευθείς το πρώτον εν τη Εκκλησιαστική Αλήθεια, νυν δε αναθεωρηθείς και εν μέρει διασκευασθείς υπ’ αυτού εκδίδοται αύθις εγκρίσει και δαπάνη της Ιεράς Συνόδου της του Χριστού Μεγάλης Εκκλησίας. Εν Κωνσταντινουπόλει 1882." ↑ Title: (Greek) "Εκθέσεις περί της καταστάσεως της Μεγάλης του Γένους Σχολής, 1867-1875 υπό Φιλοθέου Βρυεννίου αρχιμανδρίτου και σχολάρχου, εν Κωνσταντινουπόλει 1875." ↑ Title: (Greek) "«Βραχεία διασάφησις περί των εν Μικρά Ασία Διαμαρτυρομένων Ιεραποστόλων», Εκκλησιαστική Αλήθεια 4 (1883-1884), σελ. 209-215." ↑ P. Schaff. Teaching of the Twelve Apostles. pp.8-9, 289-295, New York, 1890. Bryennios, Philotheos, Metropolitan, (1833-1917). Teaching of the Twelve Apostles : recently discovered and published by Philotheos Bryennios, Metropolitan of Nicomedia (1884). Transl. and Ed. by Prof. Roswell D. Hitchcock and Prof. Francis Brown. New York: Scribner, 1884. 64 pp. (Greek) Δημήτριος Σταματόπουλος. Φιλόθεος Νικομηδείας. Encyclopaedia of the Hellenic World, Asia Minor. 23/7/2002. Retrieved: 2013-04-09. Philotheos Bryennios. Wikipedia. Retrieved: 2013-04-09. Philip Schaff. BRYENNIOS, PHILOTHEOS. The New Schaff-Herzog Encyclopedia of Religious Knowledge, Vol. II: Basilica - Chambers. 1908–14. (Christian Classics Ethereal Library (CCEL)). Retrieved: 2013-04-09. "Bryennios, Philotheos." Encyclopædia Britannica. Encyclopædia Britannica 2009 Ultimate Reference Suite. Chicago: Encyclopædia Britannica, 2009.